Opencart Marketplace Mobile App : Opencart Marketplace Mobile App converts your marketplace store for Opencart into a mobile app. Your customers can easily purchase products on the go. They don't need to have a laptop or desktop, they can easily explore your store through their smart phones. It will not only benefit the store owner and customer it will benefit the seller's too. 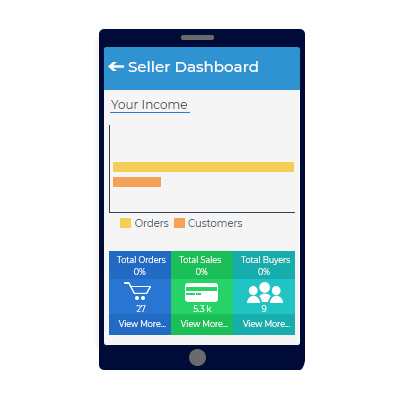 Sellers can see their dashboard, order history through the mobile app. So what are you waiting for, you must now have a Opencart Marketplace Mobile App to be a step ahead. The app can provide small-scale retailers to showcase their product in a marketplace as SOUQ. This app can be helpful to all the sellers in the marketplace, the store owner and the customer who is using the app. Our Opencart Marketplace Mobile App is fully compatible with our Opencart Marketplace Module. To use this Mobile App, you must have installed Opencart Marketplace module. A seller can monitor the insight of total buyers for the seller & Sales Analytics. A seller can able to add the product and it has the facility to edit/delete the product. A user can review seller. Multiple currency and multiple languages are supported including Arabic RTL. Reward Point, gift voucher and coupon code functionality present. Users can apply to become a seller. A customer has an option to add the product to my wishlist. A customer can view the list of sellers selling their items at the marketplace and check their profile as well. Opencart Mobikul Marketplace provides a ravishing Landing Page where the user can see information about the latest sellers & the latest products that have been added to the Marketplace. Here a buyer can check the profile of the seller or can go through the products listed and can add those products to the shopping cart. The Seller page display details about latest sellers & the latest products. From the seller page, the user can check the Seller profile and check the listed products. The user can add the products into the cart or can add them into the Wish List. In the Seller Profile page, the customer can get all the information related to any particular seller like Seller Name, Average rating of that seller, Profile details, About Seller shop and the collection of seller's products. The customer can leave their reviews about the seller also. Seller location is also displayed using google maps. The customer will see details like Seller Name, Average rating of that seller, Profile details, About Seller shop and the collection of seller's products. The customer can also check Seller Location by Google Map. The app gives the ability to the store sellers to review the activities being conducted on products related to them. Here the seller can see. Latest orders that have been placed for the seller's product. This will allow the sellers to easily manage the products being sold. Thus, helping in better sales and attraction of maximum customer on the store. In Seller Order, the seller can view and manage their orders in a very efficient way. This section has a list of all the orders that have been placed by the different customers. The seller can view any order and can see different information like Order id, Shipping address, Payment method used, description of the Item ordered and the Order status with the date. With the growth in smartphone users, the e-commerce store owners are now shifting from website to store. So, to fulfill the requirement we have Opencart Multi-Vendor Mobile App. Seller and store can take advantage of the based app to attract more customers. The localization of the app is one the most important feature of any e-commerce based app. The app can become a much efficient mode of attracting the customer.With the ability of translation, it can prove to be even more advanced form. Not only translation the app is quite responsive and will change its layout from LTR to RTL if there is a modification in language type. Did you buy Opencart Multi Vendor Mobile App? The apps are working well exactly the way we want, usefriendly, nice layout and good functionalities. The support was great. I have seen various opencart apps. But the best app for webkul is opencart. With an efficient application, you will have plenty of support. I was satisfied with the webkul support service. We have received outstanding service and support. The Opencart Multi Vendor Mobile Appn Feature and functions are first class. Every request for support has been met. Thanks guys, keep coding, your doing a great job. Yes, you will get both the mobile applications (Android & iOS) with the Mobikul Mobile App builder for Magento. Why is there only "Publish through Webkul Google Play Store Account" not the iTune Store account?